Weibo is an open social media platform with many brands posting marketing-related material every day. It’s hard to create effective marketing content that attracts attention and conveys messages simultaneously. What kind of Weibo content is best at attracting an audience in this competitive environment? Who can you work with? And how can you work with them? Here are five types of content that have proven successful in Weibo marketing. With huge fan bases and millions of Weibo followers, Chinese celebrities are in the public eye and content that features them is likely to generate wide-ranging discussions. Celebrity endorsements and participation are very efficient at attracting public attention to a brand or a product. By way of illustration, Tencent Games (@腾讯游戏) recently worked with Lu Han (@M鹿M), a popular Chinese star, to promote its mobile game, King of Glory (@王者荣耀). King of Glory is an online mobile game developed by Tencent Games. Due to its similarity to the hugely popular League of Legends, it quickly became one of the top mobile games in mainland China. Recently Tencent Games invites Lu Han, who’s got 32 million followers on Weibo, to be the spokesperson for King of Glory and launched a campaign called “Find Lu Han in King of Glory.” Due to Lu Han’s popularity, his Weibo post, inviting followers to play the game with him, has been reposted more than 194,000 times and received more than a million likes. Tencent Games also produced a short video of him playing the game. Since Lu Han is also a senior player of the game, he shared his gaming experience and why he liked the game. Encouraged by Lu Han and the official King of Glory account, many players also posted their gaming experiences with the hashtag #Find Lu Han in King of Glory# (#在王者荣耀偶遇鹿晗#). At the time of writing, the hashtag page has been viewed 170 million times and discussed 37,900 times. Relying on Lu Han’s influence, Tencent Games attracted not only existing and potential game players but also collected plenty of UGC (User-Generated Content). Apart from being spokespeople, celebrities are also paid to participate in marketing campaigns by merely posting or reposting content related to the product or brand. In these posts, they add a link to the official Weibo account or online shop of the brand. In general, this kind of celebrity participation is less costly than an official endorsement. ↑ Yang Mi (@杨幂), a famous actress, posted a photo of herself with a beauty apparatus from Jindao (@金稻官方微博) and a link to Jindao’s official Weibo account. Reminder: The influence of Chinese celebrities is considerable and it’s very expensive to invite a first-tier celebrity like Lu Han or Yang Mi to participate in a campaign, which may cost millions of RMB for one Weibo post. Weibo KOLs are a great choice for marketing cooperation. Although they may not be as well-known as celebrities, they have relatively large follower bases. Some are experts in a particular field who are valued for their professional opinions and product recommendations. When brands cooperate with Weibo KOLs, instead of relying on one KOL’s influence, they often invite several KOLs who are known in a certain field to create content. A recent example is the collaboration between Max Factor (@MaxFactor蜜丝佛陀) and three KOLs in the fashion industry: Mr. Kevin (@Kevin凯文老师), Youlina (@优里娜) and makeup artist MK (@化妆师MK). Max Factor is a popular cosmetics brand that recently nominated Mr. Kevin as its Asian region creative director. Active in the cosmetics industry for more than ten years, Mr. Kevin has reached a position of prominence in the industry and accumulated more than five million followers on Weibo. To promote Max Factor’s new BB cushion, Mr. Kevin produced a short video to introduce it and demonstrate it in use. Max Factor also sponsored two other Weibo beauty KOLs, Youlina, and makeup artist MK, to produce similar videos. In their videos, which featured the Max Factor logo, both of them tried Max Factor’s BB cushion and encouraged their viewers to purchase it. They posted their videos on the same day. Their videos received 1.7 million views in total, successfully attracting many existing and potential customers. KOLs may attract less attention than traditional celebrities but their followers are often a better fit for brands as their followers are very interested in the products that they promote. Because Mr. Kevin, Youlina, and MK are all professionals in the beauty and cosmetics industry, their viewers are very likely to purchase Max Factor products because they trust the professional standards of these KOLs. Besides working together with celebrities and KOLs on Weibo, brands also create original content to attract public attention. To maximize the influence of their brands, they make efforts to come up with creative ways to capture and affect audiences during festivals. Successful festival marketing relies on outstanding content to create a buzz. For instance, Didi Chuxing (@滴滴出行), a popular ride-sharing company, recently took advantage of Mother’s Day and China’s Valentine’s Day (May 20th; in Chinese, “520” is a homophone for “I love you”) to make its new functions and features public. Recently, Didi developed five new services with the aim of ensuring passengers’ safety. To further eliminate customers’ concerns and build a positive image, Didi produced five short creative videos to attract public attention. The most successful one was posted on Mother’s Day and entitled “Strategies for a Pleasant Meeting with your Mother-in-law.” This short video hilariously demonstrated how a man should behave with his mother-in-law. To pass his mother-in-law’s examination, he qualified himself as a rich, successful man by showing her all his formal documents such as his degree, deeds and bankcards. At the end of the video, there’s an introduction of Didi’s new regulation that all their drivers are required to have recognized certificates in order to pass Didi’s vetting process. The video went viral on Weibo and got four million views. The other videos, posted around May 20th, combined creative dating stories with illustrations of how each of Didi’s new services work. These short videos captured public attention, successfully conveyed the brand’s message and helped build Didi’s positive public image. Note that various kinds of festivals, together with key events such as the World Cup, the Oscars and world Expos, are likely to arouse discussion and become trending topics on Weibo. Since trending topics are searched more, attach the hashtag of the event to your content. On Weibo, giveaway campaigns are an efficient, common way to appeal to new followers and engage existing followers. These campaigns usually take the form of a brand encouraging followers to repost articles/posts or like them in return for a chance to win a lucky draw for one of the brand’s products. During the campaign, the official account of the brand may accumulate more followers and collect UGC from the lucky draw entrants. Moreover, rewards-oriented Weibo content directly stimulates sales as well. 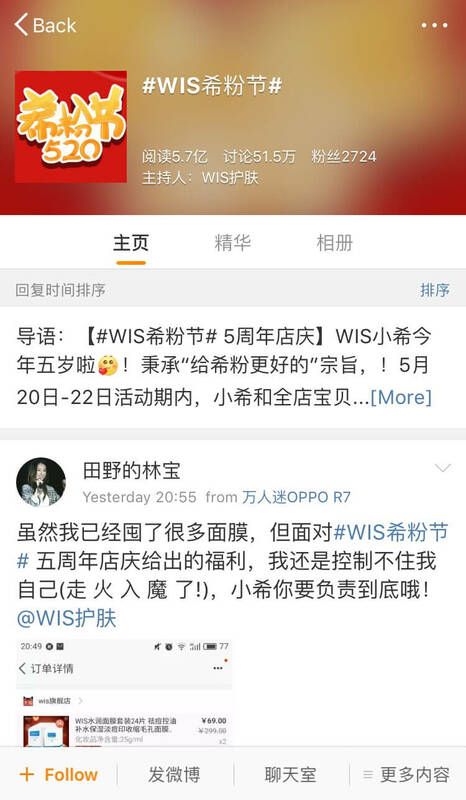 Well-known for its skin care products, WIS (@WIS护肤) is a popular brand in China with three million followers on Weibo. 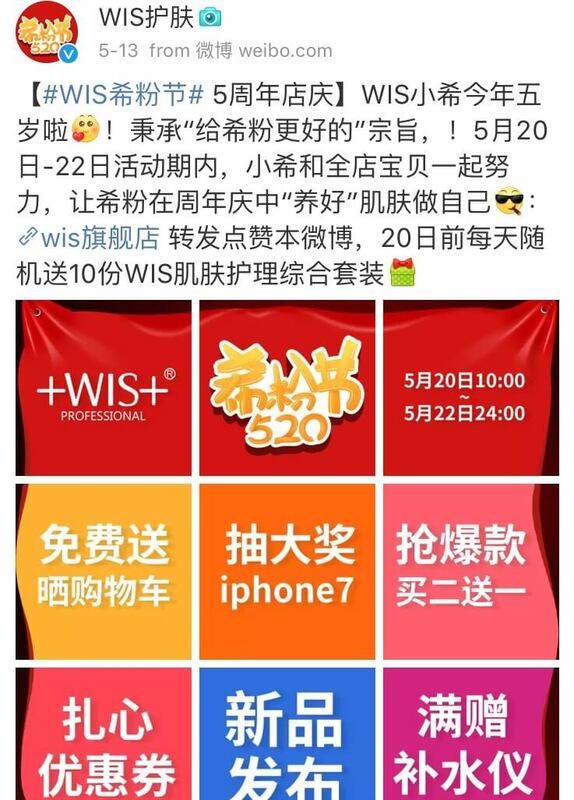 To stimulate sales and give back to its fans whose nickname is “Xifen,” WIS launched a sales campaign called “WIS’s Xifen Festival” with a series of promotions such as coupons, giveaways, and “Buy two, get one free.” The title of the campaign was also used as a hashtag on Weibo. Before and during the campaign, the official account frequently posted information related to the campaigns with hashtags and links to WIS’s online shop. Its reward campaigns not only encouraged followers to repost but also to show their receipts for WIS products for coupons and chances at giveaways. 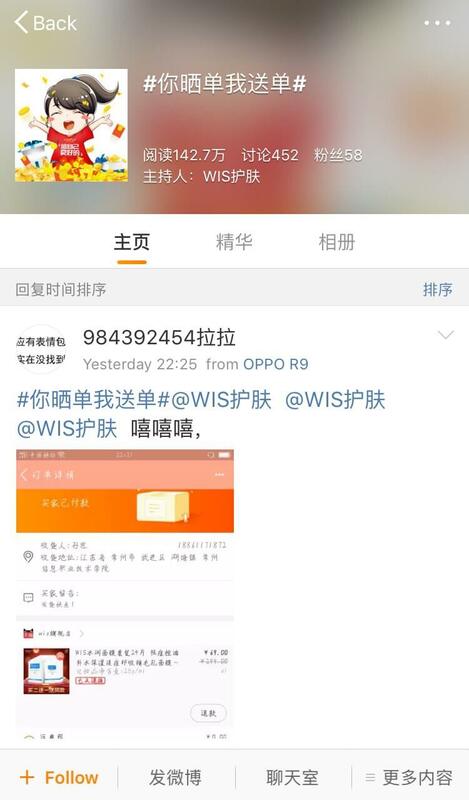 By doing so, WIS managed to promote its sales campaign on its online shop and engaged many followers to participate. The hashtag’s page was viewed 570 million times and discussed 515,000 times. When people are motivated to purchase a product, they seek feedback from trials and comparisons between similar products. People who share this kind of information usually aren’t famous or followed by many users, but they provide useful information about certain products. Many people find their posts of comprehensive feedback and product comparisons through keyword searches on Weibo. Many users call these bloggers “Zhongcao bloggers” (种草博主), suggesting that they’re experts in promoting the advantages of a product to appeal to purchases. Miaogu Jiang (@特立不独行的喵咕酱) loves to share her reviews of cosmetic products, food, films and so on. In a recent post, Miaogu Jiang recommended three kinds of healthy diet food fromWu Gu Mo Fang (@五谷磨房), a Chinese health food company. When she recommended the products, she emphasized that she wanted to stay healthy but didn’t want to play any sports. Since many readers had similar ideas, they believed that the products suited them. Due to the comprehensive feedback of “Zhongcao bloggers”, readers learn a lot about the products they write about. Compared to other KOLs’ posts, information-oriented Weibo content emphasizes useful information rather than personal influence. For Weibo marketing, whether you’re working with influencers or creating content independently, brands are expected to come up with attractive, informative Weibo content that maximizes its marketing effects. Strategically focusing on the 5 types of Weibo content listed above and using appealing images and short creative videos works well to attract viewers.